As most Midwesterners know all too well, a sudden, intense downpour can have very damaging consequences to homes, lawns and gardens. 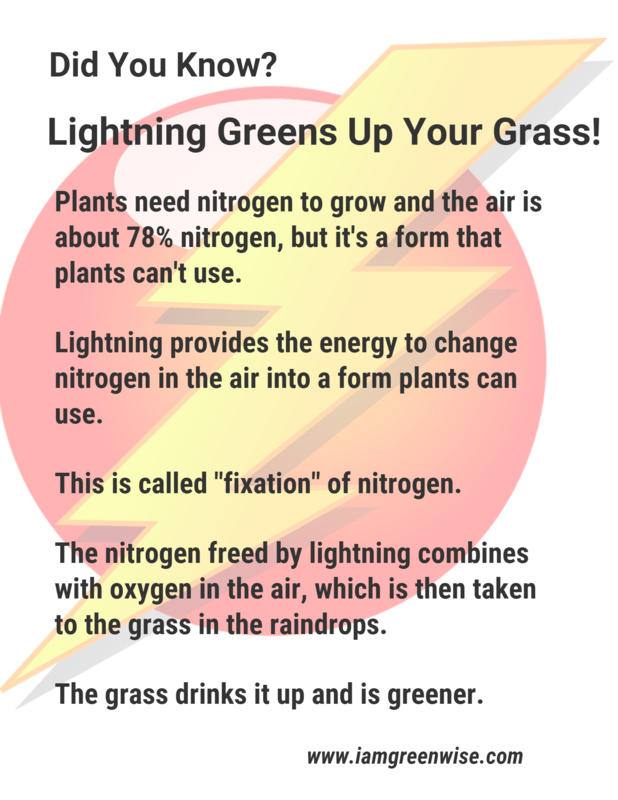 Luckily, there are ways you can help storm-proof your landscape to better protect your property and the environment. With a few simple landscaping additions, you can better storm-proof your property. Storm-proofing will mitigate damaging soil erosion and manage storm-water runoff, saving thousands on property damage when the next deluge hits. When a hard rain hits hard surfaces, such as dry, clay soil or pavement, it quickly runs off to where it may cause harm. 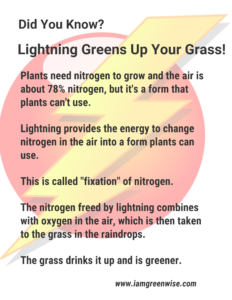 To make matters worse, without significant vegetation or porous surfaces to sink into rain sweeps across yards and streets and carries pesticides and sediment into the water system. 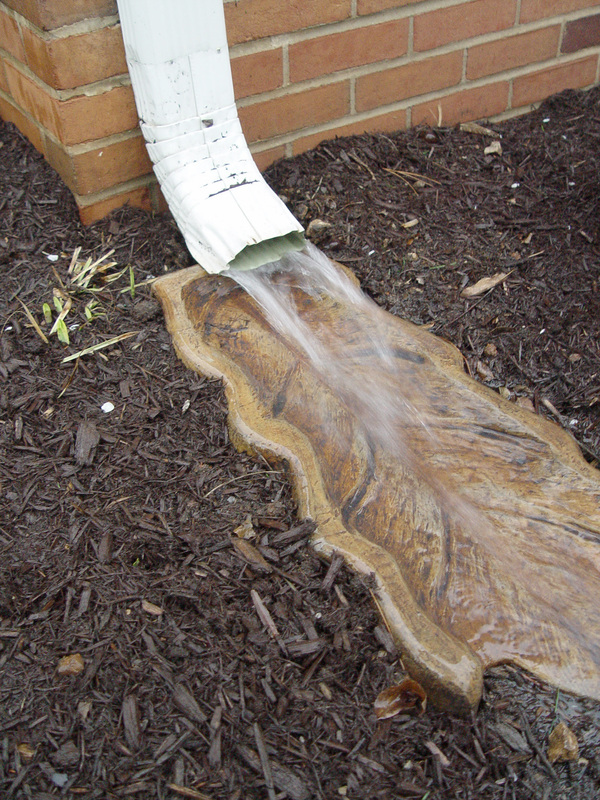 Urban storm-water runoff is the leading contributor of water resource pollution. And runoff is also a primary cause of residential flooding. Storm-proofing your property will save money in other ways. For example, when you divert drainage and reduce impervious surface areas, you will significantly lower your utilities bill. A swale directs excess water flow to channel it somewhere it can be released safely. A swale is a depression in a landscape that redirects water drainage. 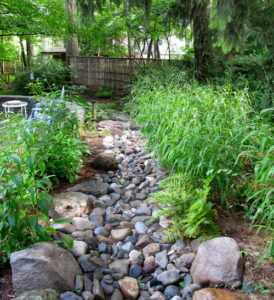 You can maximize swale use by lining the lowest point with rocks and adding deep-rooting plants to the slopes, slowing water’s path to the drain. A swale directs water flow, rather than stopping it. Therefore, you must make sure that it’s channeling to somewhere excess water will be released safely. Direct swales in frequently flooded areas to a dry well, or a garden bed with very good drainage and high water tolerance. To avoid utility charges, never have a swale draining straight off a property. 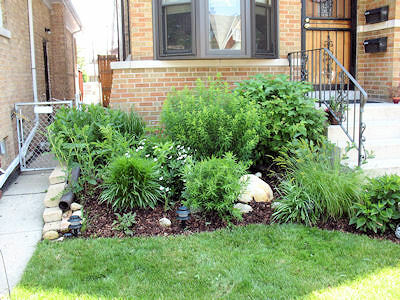 Rain gardens add beauty and storm-proof functionality to any property. Although similar to swales, rain gardens don’t redirect water. Instead, they provide a place for water to pool during a downpour. This allows excess water to slowly percolate back into the soil. Most range from 50-100 square feet, and even a small, inexpensive rain garden can significantly reduce flooding and runoff. Native plants make a more low-maintenance yard and cut down on the need for harmful pesticides. Don’t forget the smallest changes. A downspout diverter prevents flooding next to the walls, and gets water out to lower ground. 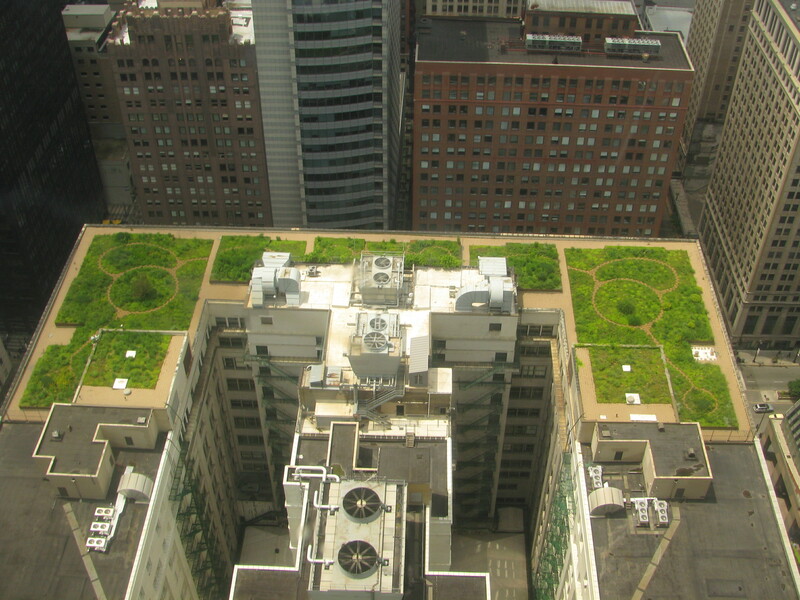 The City of Chicago recognized the positive environmental impact of a green roof– and installed one on City Hall! 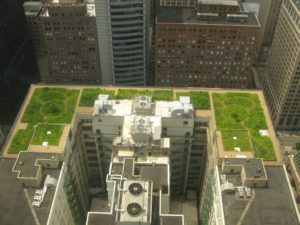 Green roofs are being installed more and more, and have become increasingly affordable. If you have a flat or gently sloping-roof, modular units are becoming popular for their ease of installation. People often worry the added load will cause extra-strain, but a study by the city of Portland, Ore, found that green cover actually increases the longevity of the roof. Also, the study found that ecoroofs provided better insulation, reducing heating and cooling costs. 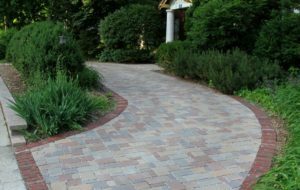 Driveways made of impermeable surfaces, such as asphalt and concrete, are the biggest contributors to storm-water runoff. To mitigate flooding, add drainage on the sides of the pavement. Or ditch the asphalt or concrete pad altogether. 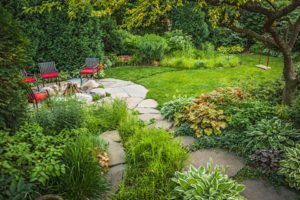 Storm-proof landscape design– with storm-water in mind– will keep your wallet, yard, and environment a little greener in the long run. And take some worries out of rainy days. These are all great idea for dealing with excess water during a storm. I’ve noticed that big puddles in my yard don’t just ruin the grass, but they also attract bugs. I plan on doing some landscaping to help control the flow of water. I like the idea of using a swale to direct the water, but I think a hidden, underground channel would fit better with my current landscaping. Your observation about bugs is very timely too as we’re looking for ways to control the mosquito population. Why spray toxic pesticides to kill mosquitoes when you can safely prevent them by relandscaping to get rid of their breeding ground? 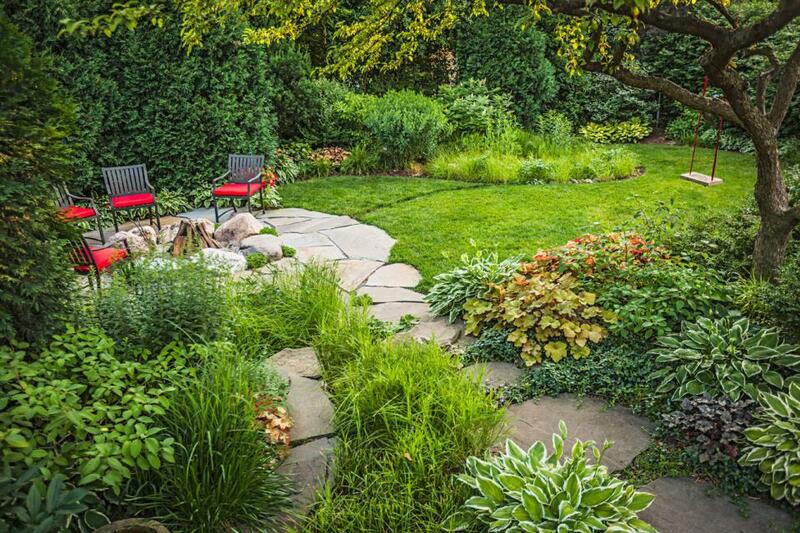 I like that you talked about making a rain garden as part of your landscape. I think that you should plan the kind of landscape you want. If you don’t think you can do it all yourself, you can always hire a landscape service. I like how you said that storm-proofing your property will save money. I just got a stormwater system installed on my property. Thank you for the tips on storm-proofing your home. Sutton, I realize I’m seeing this way after the fact, but I’m glad the article was helpful to you and I hope your system has been serving you well! Thanks for taking the time to write!